Throughout history, plants developed time and time again the tree form. The first "tree" appears during the Devonian period, between 350 and 420 million years ago. This Progymnosperm is called Archaeopteris. Its wood resembles that of conifers, its trunk is thick, and it can reach up to 50 m. But it reproduces with spores, much like ferns. During the Carboniferous era, the Lycopsids division reinvents secondary thickening and foliage. Some also reach 50 m. Those strange trees have a predetermined growth in height and ramification, and grow very fast but die after sporulation. The remains of those ancient forests transformed in today's coal. Today, there is about a thousand Lycopsid species, all herbaceous plants. 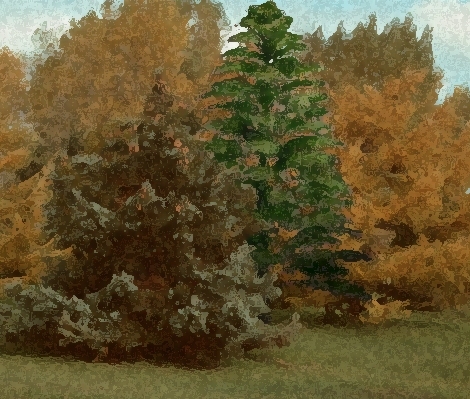 From the Jurassic (the dinosaur era), we find two venerable ancestors: the Wollemi pine (Wollemia nobilis), a conifer species older than 150 million years, and from which only 40 individuals survived to this day; and the Ginkgo biloba, a Gymnosperm so ancient that it precedes the evolution of seeds (its "fruits" are really naked ovules).